Bartenders, as the thirstiest among us may know already, reserve the right to refuse service to anyone. 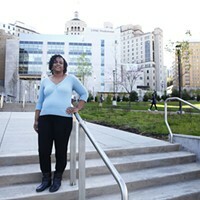 And a cadre of pissed-off local hootch-slingers plans to use that right to protest Allegheny County's contentious new 10 percent tax on poured drinks. 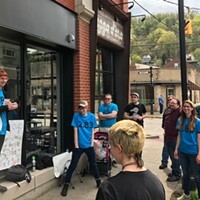 The protest is being organized by Barsmart.com, a website for reviewing and discussing local bars and nightlife. 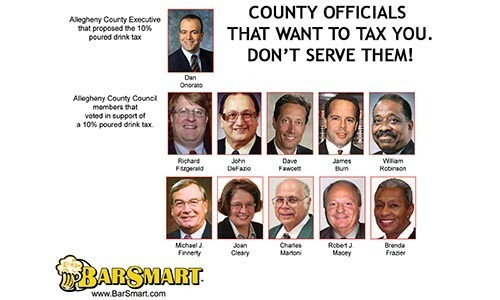 A discussion in the forum section of that site came up with the idea of creating a handbill with pictures of County Executive Dan Onorato and each of the 10 county councilors who voted in favor of the tax. Available on the Web site www.dontservethem.com, the flier serves as a not-wanted poster: Above a rogues' gallery of photos (which were culled from the county's Web site), the poster urges "Don't Serve Them!" "Our big thing is to get the word out: bartenders letting their customers know they had to raise prices," says Nathaniel Beall, CEO and president of Barsmart, during an interview at Howler's Coyote Café, in Bloomfield. "It's not the bar; it's these guys," he says, gesturing to the photos. "I wanna see these in every bar in Pittsburgh," agrees Jo Albright, Howler's bartender and booking manager. "I want every bartender to say, ‘You didn't serve us, we're not going to serve you.'" There haven't been any documented cases of bartenders refusing to serve county officials. City Paper was unable to verify a rumor about that very thing happening at a Ross Street watering hole. It's unclear whether such defiance would have any effect on officials. Asked whether Onorato had seen the posters or had a response to them, spokeswoman Megan Dardanell declined comment. But even if county leaders don't actually suffer punishing bouts of sobriety in county bars, backers say they still think the fliers will be an effective tool. While there is slim hope of averting the tax at this point, Beall says the fliers may at least stoke the rage of voters when the pro-tax councilors come up for re-election. "It's not lost yet," says Beall. 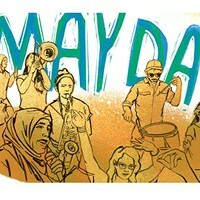 "The very least we can do is get rid of all these people, make them have a workaday job." Albright says she's heard people say that a 10 percent tax won't put that much of a hurt on their nights out. But what they don't realize, she says, is the hurt it'll put on her nights in. "I'm a mom, I raised seven kids and I have 11 grandkids," she says. "On a good night, I make $150. Now I'm going to take home half that. What am I going to give up? Instead of a hamburger once a week, my husband's going to live on pancakes and pasta?" Albright worries that even if customers still drink as much, her tips will go down. If a beer costs a dollar, she says, a customer may lay down two dollars: a buck for the brew and a dollar tip. If the beer costs $1.10 with tax included, the customer will probably still lay down the same two dollars to cover the beer and the tip ... and Albright's husband is one dime closer to pancakes and pasta. She says the tax will hurt the music industry as well. If bars take in less money, they'll have less to spend on entertainment. "You still may go out and have a couple cosmos, but we won't be able to afford that DJ that you like," she says. Last summer, Howler's hosted Rock for Wishes, an all-day, 11-band benefit for the Make-A-Wish Foundation. "It brought 200 people on the block," she says. "They went for pizza, they went to Tessaro's. If we're going to take that kind of hit [from the drink tax], I can't put 11 bands here. Next year, half that many people come. They can't afford to spend money on beer and bands and donate to charity." Albright is also galled by the idea of pitting the nightlife industry against the Port Authority. The tax is meant to bail out the financially floundering bus system, which seems ironic to folks who work or play until 2 a.m. or later, when service on many bus routes stops. "We can't catch a bus after work anyway, we have to catch a cab," says Albright. "The 54C is the only route that makes any sense -- that stops [running] at midnight!" A tax that actually kept buses running until a time that would be useful to servers and barflies might be easier to swallow, says Beall. "If they're going to tax the nightlife industry, why not benefit the nightlife industry?" asks Beall. "The comment that made me choke was Onorato saying he had no other options," Albright fumes. "He said it was a conspiracy by his Republican opponents. I'm a lifelong Democrat and I will vote for Mickey Mouse to get this guy out of office. Do I look like a Republican? I'm a 50-year-old rocker chick!" These 11 people may end up being the thirstiest 11 people in Allegheny County.